The history of the light bulb is filled with rivalry, failures and great achievements. The electric light bulb has been called the most important invention since man-made fire. The light bulb helped to establish social order after sundown, extended the workday well into the night, and allowed us to navigate and travel safely in the dark. Without the light bulb, there would be no nightlife. However, creating a steady and affordable source of illumination was not as easy as many history textbooks suggest. 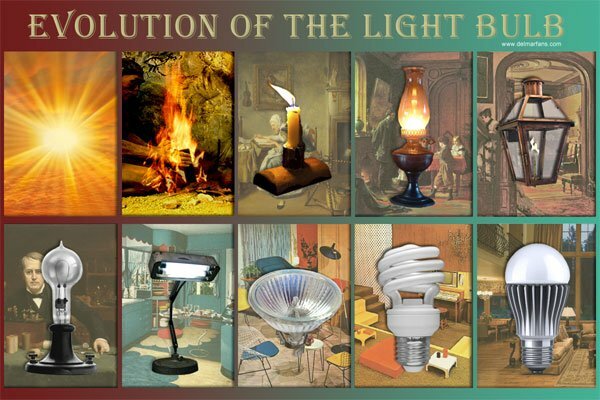 The modern light bulb is the result of many innovators' work and continuous improvements over 150 years. In the 18th century, candles and oil lamps illuminated many light fixtures in most homes and businesses. These early sources of illumination emitted a weak light, smoked, and gave off foul odors. They were also dangerous and required constant attention. Wealthy aristocrats used beeswax and spermaceti candles to light up their lavish households. The middle class used cheap tallow candles while the poor used rushlights, makeshift candles made from reeds dipped in animal or vegetable fat and ignited, which burned for a short time. During the 19th century, gas lighting replaced candles and oil lamps in many homes, businesses, and streets. Gas lamps produced a brighter and more efficient illumination. They also cost 75 percent less than candles or oil lamps, and were easier and safer to operate. By the 1850s, most city streets in the United States and Europe were illuminated by gas lamps. Gas lighting is credited with reducing crime rates and increasing literacy in many areas. As electricity became more widespread during the turn of the century, gas lamps were replaced by incandescent lamps in streets, businesses, and theaters. In 1802, Sir Humphry Davy, an English physician, created the first electric light by passing a current through a platinum strip. The glow did not last long, but it marked the beginning of the history of light bulbs. In 1809, Davy demonstrated the first carbon arc lamp at the Royal Institute in London by connecting two wires to a battery and attaching a charcoal strip between the other ends of the wires. While the scientific community and the public raved about the demonstration, the arc lamp burned too brightly and consumed a large amount of current, which quickly drained the battery and rendered the lamp impractical for commercial development and production. Several decades passed before electric generators made arc lamps practical for street and theater lighting. In 1875, Pavel Nikolayevich Yablochkov, a Russian electrical engineer and inventor, developed the first practical arc lamp known as the "Yablochkov Candle." Yablochkov used two parallel carbon rods to extend the life of the battery. During the Paris World's Fair of 1878, about 64 Yablochkov candles were installed on the Avenue de l'Opéra, Plade du Théâtre Francais and around the Place de l'Opéra, earning the city the famous nickname of "City of Lights." The success of the exhibition was influential in bringing electric lighting to the masses, and arc lamps were soon installed on many streets in the United States and Europe. Arc lamps produced an intense, bright light that was ideal for illuminating streets and outdoor spaces, but the dazzling lights were not suitable for indoor use. During the late 1880s, Thomas A. Edison and many other inventors began to experiment with incandescent lamps in search for a reliable and economical form of indoor lighting. Arc lamps were used for searchlights, lighthouses, stadium lights, film production lights, film projector lamps, and other high-intensity lighting applications until the 1980s when advancements in short-arc lamps made them obsolete. Incandescent light bulbs use electricity to heat a carbon or metal base filament inside a glass bulb until it becomes hot and emits a radiant glow. A vacuum keeps the filament from burning up too quickly and blackening the interior of the glass bulb. Many of the first incandescent light bulbs faced the same challenges - a poor vacuum design, inferior and/or expensive filaments, and bulb blackening. However, these early experiments were pivotal in the development of the first commercially viable incandescent light bulb. In 1841, Frederick de Moleyns received the first patent for an incandescent lamp in England. The lamp used a glass bulb, a partial vacuum and powdered charcoal between two platinum filaments to emit light. However, the lamp was not efficient enough for commercial use. The vacuum's poor design caused the bulb to darken at the top and block light output, and the platinum filaments were too expensive. In 1865, German chemist Hermann Sprengel invented a mercury-vacuum pump, known as the Sprengel pump, that streamed mercury through a reservoir, T-junction and down a duct to evacuate the air from the vacuum and steadily lower the pressure. Inventors developing incandescent lamps quickly adopted the invention because it helped to preserve the filament inside the bulb. In 1874, Henry Woodward and Mathew Evans filed a patent for an incandescent light bulb with a carbon filament in Canada and the United States. The light bulbs, although they worked properly, sold poorly. They sold their patent to Thomas Edison in 1879. In 1878, William E. Sawyer and Albion Man received the first U.S. patent for "improvement of Electric Lights." The lamp consisted of a nitrogen-filled globe with a carbon conductor, supported by large zigzagging radiators. The lamp’s rigid design prevented the carbon conductor from expanding and contracting, causing the lamp to break frequently. The first Westinghouse light bulbs were based on the Sawyer-Man incandescent lamps. In many textbooks, Thomas A. Edison is solely credited with inventing the modern incandescent light bulb after 10,000 attempts. Edison, an undisputed visionary, was not the only one competing to develop the first commercial incandescent bulb. Countless chemists, physicists, and inventors clamored for the honor and substantial payoff. In 1878, a young Edison stated that he could create a safer, cheaper, and more reliable incandescent light to replace existing gas lights in just six weeks. The announcement caused gas company stocks to plummet. At 31 years old, Edison had already earned the nickname of the Wizard of Menlo Park for his innovation and inventions, including the stock ticker, quadruplex telegraph and phonograph. He gathered financial backing and assembled a team of 14 engineers, machinists, and physicists known as the “muckers” in Menlo Park, NJ, to research and develop an incandescent light bulb. Notable team members included American mathematician and physicist Francis Upton, American mechanic Charles Batchelor, and Swiss-born machinist John Kruesi. During this time, Edison and his team created several incandescent light bulb prototypes, including a lamp with a platinum filament, which oxidized slowly and had a high melting point. To prevent the filament from overheating and burning out, a problem that plagued earlier inventors, he created a regulating system that intermittently diverted the current away from the filament, permitting it to cool. The system was difficult to manufacture and operate, and the light bulb itself would shut off every few minutes, rendering the lamp impractical for commercial development. At the same time, Sir Joseph Wilson Swan, an English chemist and physicist, was independently working on an incandescent light bulb with a carbon filament. Swan began working on the incandescent bulb three decades earlier, but like other early inventors, he lacked a reliable vacuum and a suitable electric source to create a practical light bulb. In late 1878, he reported to the Newcastle Chemical Society that he had created a working incandescent lamp and he received a UK patent that same year. In February 1879, Swan demonstrated a working lamp during a lecture at the Newcastle Literary and Philosophical Society. His lamp design included an enclosed bulb with the air removed, platinum lead wires, and light-emitting carbon element. Swan’s original incandescent lamp, while functional, was not practical for real-world use. The carbon rod had low electrical resistance and required a large amount of current to heat up and make the filament glow, which meant that the electric conductors to the lamp had to be short or unreasonably thick. The rod also released gasses when the lamp was turned on and dark soot quickly accumulated inside the glass, blocking light output. Swan improved his design and eventually established his own electric lighting company, The Swan Electric Light Company, in 1881. In 1879, Edison and his team discovered that a thin filament with high electrical resistance was more efficient. This meant that only a small amount of current and reasonably sized copper cables were needed to make the filament glow. The team also experimented with carbonized filaments made from baywood, boxwood, cedar, cotton, hickory, and flax. On New Year's Eve, Edison demonstrated his new innovation to 3,000 guests at Menlo Park. In 1880, Edison's team improved the light bulb with a bamboo filament that burned for 1,200 hours. The carbonized bamboo filament became the standard filament for the next ten years. The same year, Edison received a second U.S. patent for incandescent light bulbs. Representatives of the Edison Electric Light Company promoted the new incandescent lamps by holding demonstrations at the Menlo Park lab and attending trade shows and expositions all around the country. The demonstrations were designed to associate Edision's name with the new lighting technology. During this time, Edison pursued legal action after Swan after mutual allegations of patent infringement. He lost and was forced to settle with Swan by making him a partner in the British electric company. In 1883, the Edison Electric Light Company, Ltd. merged with The Swan Electric Company and became the Edison and Swan United Electric Light Company, Ltd. (commonly known as Ediswan). Edison bought Swan out of the company after a few years. Thomas Edison did not invent the first light bulb; however, he did improve the design and performance of the earliest incandescent lamps to create the first commercially viable light bulb. He also developed other inventions that made the light bulb practical to for everyday use. The Edison Screw, a system of screw mounts that ensures compatibility between a light bulb and the base of a light fixture, and a complete electrical lighting system (including feeders, switches and meters) not only capitalized on his light bulb design, but it also made him a household name and secured his name in the history books. Edison's light bulb remained unaltered for several decades. In 1911, William D. Coolidge, an American physicist at General Electric (GE), developed tungsten filaments that lasted longer and burned brighter than carbon filaments. GE overhauled their bulb-making equipment and began selling light bulbs with tungsten filaments, replacing the carbonize bamboo filaments. In 1913, American chemist and physicist Irving Langmuir discovered that filling a light bulb with an inert gas such as nitrogen and twisting the filament lengthened the life of the tungsten filament. In 1925, Marvin Pipkin, a American chemist and inventor, developed the frosted incandescent light bulb. Pipkin also devised a silica coating process that helped diffuse light, reduce glare, and minimize loss of light output. The halogen light bulb was first introduced in 1959 by GE. These light bulbs, while an adaptation of incandescent light bulbs, reduced the uneven evaporation of the filament and darkening of the envelope by filling the lamp with halogen gas rather than an inert gas. Halogen bulbs also lasted longer with an average life of 1,500 hours, and consumed 15 percent less energy. Despite numerous improvements over the years, modern incandescent bulbs remained inefficient. About ten percent of the electric power supplied to an incandescent light bulb is actually converted into visible light. The remaining energy is wasted as heat. The U.S. oil crisis in the 1970s sparked interest in renewable sources of energy and energy-efficient residential lighting. Lighting engineers began to adapt fluorescent lighting for residential use. Fluorescent lamps had been in use since the 1930s, but they were mainly used for commercial and industrial lighting. In 1976, Edward E. Hammer, an engineer at GE, bent a fluorescent tube into a spiral shape, creating the first compact fluorescent light bulb (CFL). GE initially shelved the design because the machinery needed to mass produce the light bulbs was too expensive at the time. The design was leaked and shortly thereafter, other manufacturers began to produce the light bulb. During the mid-1980s, the first CFLs began to hit the market starting at $25 to $35. Consumers were hesitant to embrace the new lighting technology due to its price, size, and performance. Early CFLs were big and bulky, and did not fit in many light fixtures. They light bulbs also emitted a low light and performed inconsistently. Subsequent improvements in CFL prices, performance, and efficiency made them the ideal choice for energy conscious homeowners and business owners. Today, CFLs use 75 percent less energy than traditional incandescent light bulbs. They also have an average life 10,000 hours, about ten times longer than the average life of an incandescent bulb, and cost as little as $1.71 per bulb. Light emitting diode (LEDs) are one of the fastest growing lighting technologies today. LEDs are a type of solid-state lighting that uses semiconductors to convert electricity into visible light. LEDs emit light in a specific direction, minimizing the needs for reflectors and diffusers that can trap light, and absorb the heat produced via a heat sink. In 1961, James R. "Bob" Biard and Gary Pittman at Texas Instruments discovered the first light-emitting diode while attempting to create a laser diode. The following year, Nick Holonyak Jr. at GE developed the first visible red diode. In 1972, M. George Craford developed the first yellow diode. Craford, a graduate student of Holonyak, also improved the red diode and developed red-orange diode. The same year, Herbert Maruska and Jacques Pankove developed the violet diode. As companies improved red diodes and their production, they began to appear as indicator lights and calculator displays during the late 1970s. During the 1990s, researchers focused their efforts on increasing the energy efficiency of light-emitting diodes. In 1993, Shuji Nakamura developed the first bright blue light-emitting diode, the last component needed to create bright white LED light. Shortly thereafter, scientist experimented with blue, red, and green diodes by coating them with phosphors to make them appear white. During the early 2000s, the first LED light bulbs hit the market. In 2008, the U.S. Department of Energy announced the L Prize Competition, a competition designed to push the development of ultra-efficient solid-state lighting products. In late 2009, Philips Lighting North America entered its LED bulb in the competition's 60-watt replacement category. The Department of Energy estimates that at the time, 971 million 60-watt incandescent light bulbs were in use. In 2011, Philips Lighting won the L Prize 60-watt replacement category after a rigorous review process. The winning light bulb cost $40 and was reported to last more than 27 years. Since 2008, the price of LED bulbs has decreased more than 85 percent, making them an affordable choice for illuminating homes, businesses, and public spaces. LED bulbs are six to seven times more efficient than incandescent light bulbs, cut energy consumption by 80 percent, and last 25 times longer than incandescent bulbs. In 2012, 49 million LED products were installed in the U.S., saving about $675 million in annual energy costs. The modern-day light bulb not only revolutionized home and work life, it also influenced urban development and accelerated the economy. Many people migrated from rural areas to the city in search for work. Late-night restaurants, businesses, and sporting events provided new employment opportunities and entertainment. Electric light bulbs created the practice of shift work, increased worker efficiency, and allowed for greater productivity. They also improved working conditions, eliminated heat and pollution caused by gas lighting, and reduced fire hazards. The cost of electricity was often offset by the reduction of insurance premiums. Light bulbs also changed how products were marketed to consumers and gave rise to bright billboards and signs. Berger, Brooke. "Many Minds Produced The Light That Illuminated America." US News. http://www.usnews.com/opinion/articles/2013/03/21/why-thomas-edison-isnt-the-inventor-of-the-light-bulb (accessed January 29, 2014). "Edison's Companies - The Edison Papers." The Edison Papers. http://edison.rutgers.edu/company.htm (accessed January 29, 2014). "Edison's Lightbulb at The Franklin Institute." The Franklin Institute. http://www.fi.edu/learn/sci-tech/edison-lightbulb/edison-lightbulb.php?cts=electricity (accessed January 28, 2014). Henley, Jon. "Life before artificial light." The Guardian. http://www.theguardian.com/lifeandstyle/2009/oct/31/life-before-artificial-light (accessed January 29, 2014). "Lighting A Revolution: 19th Century Invention." Smithsonian Natural Museum of Natural History. http://americanhistory.si.edu/lighting/19thcent/invent19.htm (accessed January 29, 2014). "Lighting A Revolution: 19th Century Promotion." Smithsonian Natural Museum of Natural History. http://americanhistory.si.edu/lighting/19thcent/promo19.htm (accessed January 29, 2014). "Lighting A Revolution: Joseph W. Swan." Smithsonian Natural Museum of Natural History. http://americanhistory.si.edu/lighting/bios/swan.htm (accessed January 27, 2014). Matulka, Rebecca, and Daniel Wood. "History of the Light Bulb." Energy.gov. http://energy.gov/articles/history-light-bulb (accessed January 26, 2014). "Rural Electrification Act - Ohio History Central." Ohio History Central. http://www.ohiohistorycentral.org/w/Rural_Electrification_Act (accessed January 29, 2014). "Sir Joseph Wilson Swan (1828 - 1914)." Joseph Swan: Biography. http://www.kstc.co.uk/josephswan/home.html (accessed January 29, 2014). Truini, Joseph. "What You Need to Know About the Lightbulb Law." Popular Mechanics. http://www.popularmechanics.com/home/improvement/energy-efficient/what-you-need-to-know-about-the-lightbulb-law-14789203 (accessed January 29, 2014). Sekiguchi, Toko and Bryan Walsh. "Shuji Nakamura." Time. http://content.time.com/time/magazine/article/0,9171,1604891,00.html (accessed January 29, 2014). Whelan, M. "History of the Incandescent Light." Edison Tech Center. http://www.edisontechcenter.org/incandescent.html (accessed January 29, 2014).